One of the things I enjoy most about my job is picking color. Changing the color of a room is the best way to give a room new life. Most people know this, but knowing doesn’t make the picking any easier. I spend a lot of time at my local paint store and I watch people stand at the paint chip kiosk, pick up a tiny square of color, stare at it for a minute, then put it down. Then repeat. It is really difficult to visualize this teeny swatch of color all over your walls. Not to mention that the light in the store is most likely different than the light in your home, so that color you’re choosing (or not) probably looks completely different in the space you’re looking to paint. 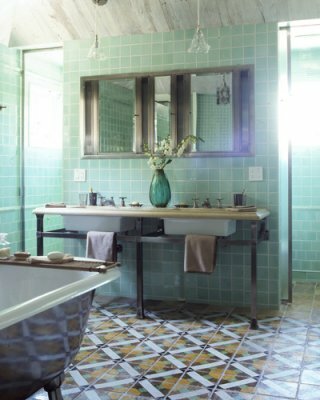 As a designer my job is to know color: how to combine colors, how color and light – both natural and artificial – interact, and how to use color to trick not so pleasant architectural features such as narrow hallways, low ceilings, etc seem more pleasing. It’s not a perfect science. Sometimes I have to try several tints and shades before I hit it on the head. But I always get there. I haven’t lost a room yet. I use a holistic approach to choosing color. You may ask me to pick a wall color for your dining room. I’ll choose that wall color, but then also give you color direction for trim, ceilings, moldings, built-ins, flooring, artwork, fabrics, lighting, furnishings, hardware. Like nature abhors a vacuum a designer abhors a hue without a scheme, so to that end I recently had a neat piece designed by r3mg: creative boutique for my color consult clients. 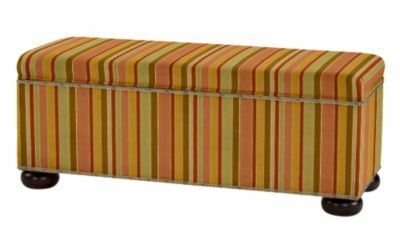 After the consult I provide a complete color scheme for the room, including wall, trim, ceiling, and any accent colors that would work well within the color scheme, all in a handy envelope. The color swatches are neatly tucked inside so that you can take them with you whenever you shop. If you see a rug or piece of artwork you like, just pull out your swatches and see if the rug color goes with your scheme. Color consults are $200. I am excited to start using my new consult piece, so if you need to pick colors, please give me a call today! I just finished sprucing up a living room and dining room in Oak Park. The homeowners are very sweet couple with two young children. They didn’t want to spend a lot of money on new furniture right now, waiting (rightfully so) till the child-lunging-off-sofas phase has passed. So I needed to work with the existing pieces: a sectional sofa, dining room table and chairs, and two floor lamps. They also weren’t up to take on any remodeling work, so the color on the walls and the position of the light fixture over the dining room table were staying. But even without making any color or major furniture changes I was able to create a room that is more pulled together and relaxing for the family. Feng shui is the Chinese art of creating balance and harmony in one’s surroundings by following the natural creative cycle of the elements – fire, earth, metal, water, and wood. The creative cycle goes like this: ashes from fire become earth. Earth creates the element metal. Metal captures water through condensation. Water feeds plants and creates wood. Wood burns fire. Paying attention to the creative cycle above enhances chi, or energy. Chi can be thought of as a fresh summer breeze, or a breath of crisp and energized mountain air, wafting through your home, touching on every room, permeating and uplifting your space. A home with good feng shui is a home that has the creative cycle in balance. If the creative cycle is disrupted, chi cannot flow properly and the energy in your home literally and metaphorically gets stale. A disruptive cycle would be one in which water douses fire, or metal chops wood, or earth dirties water. For those of you who have ever practiced acupuncture, yoga or tai chi, you understand the benefits of getting blocked chi flowing. Energy flow is essential to a healthy body. Like the energy centers, or chakras, in the body, there are eight life areas in your home that require good chi in order to function properly. They are: fame, relationships, children, mentors, career, knowledge, health and wealth. When chi is blocked and cannot flow freely into one of these areas in your home, such as your wealth area, problems can arise. These problems can manifest as lost business; unexpected expenses that keep arising; financial issues that never seem to get resolved; problems getting payment from clients; problems settling legal issues; and so forth. To determine where the wealth area is in your home, you’ll need a ba-gua map. 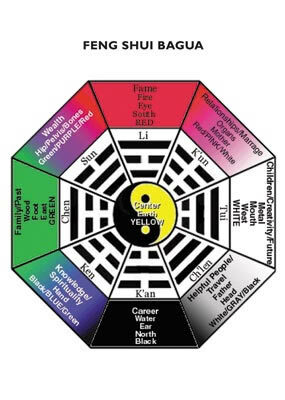 A ba-gua is an octagonal chart with its roots in the I Ching. Each side represents one of the life areas mentioned above. Standing at your front door and facing into your home, hold the ba-gua so that south is at the top. Now superimpose the chart over your home. Your wealth corner will be just to the left of the top of the chart. How does the chi get blocked? There can be several ways, but the most common is when the creative cycle is disrupted. For example, you may have a bathroom in your wealth corner. This is a disruptive cycle, and water symbolically flushes finances down the drain. How can balance be restored? Keep sink and tub drains closed. Fix leaky faucets. Keep toilet seat lids down. Then bring in aspects of wealth that enhance its properties, like the color purple. Purple is the color associated with wealth, so introduce it in the form of towels, soaps, picture frames, paint, or flowers (real or silk). Crystals help move chi by reflecting the energy, so hang a purple or clear crystal above your sink or toilet. Finally, if you have the room and natural light, bring in a jade plant because its leaves look like coins. So if you find that your finances aren’t in order or if there’s another aspect of your life that seems disrupted, consider the balance of chi in your home, and then work to correct that balance through the practice of feng shui. Someone asked me the other day if we had a sump pump for our basement. I said, no, we never get that much water…and then of course we got hit. Our basement is half finished, so luckily the water stayed mostly in the unfinished part. But because we’re thinking about finishing off the rest of it, I want a floor that is more durable than carpet, which is what we have now. Laminate wasn’t my first choice but it fit the budget, and now that it’s in, I have to say it looks great. It is very hard to tell it isn’t stone. 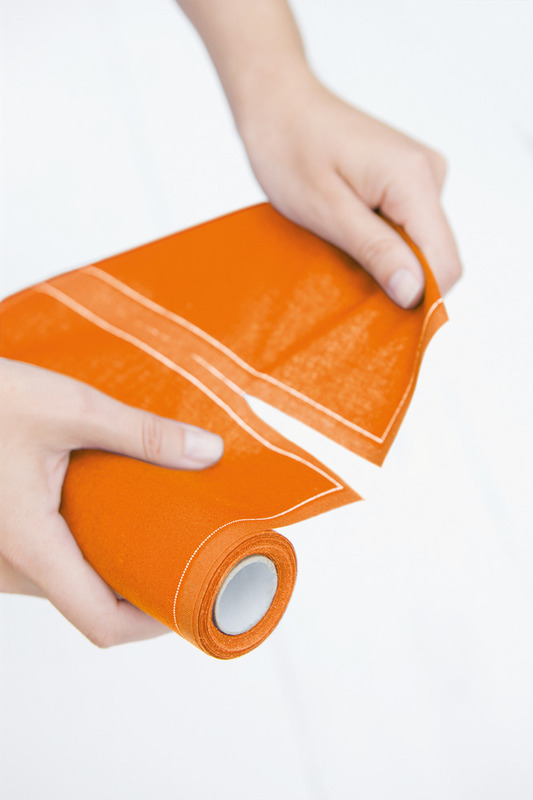 It’s durable and made from post consumer materials. 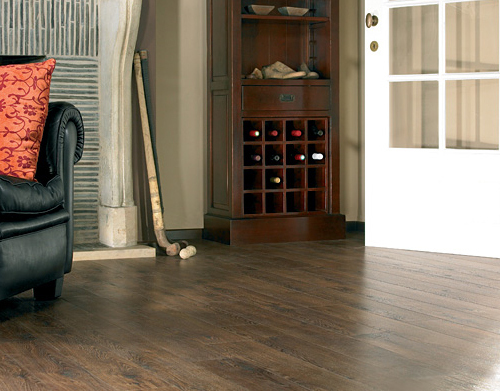 We opted for a stone look but there are lots of nice looking wood options out there too. 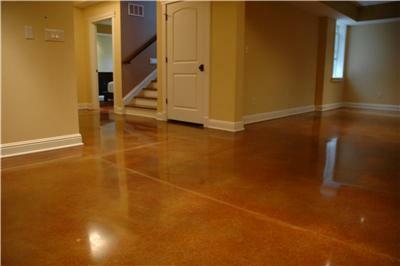 The choice I’m really leaning towards though is stained concrete. There are so many color choices to chose from, and I can just throw down rugs where I need them. If the rugs get wet, I can get them cleaned. 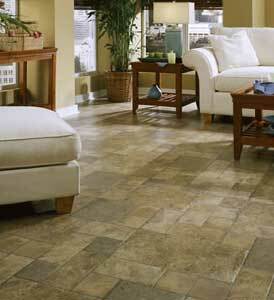 Both laminate flooring and stained concrete would work well if we ever get water again. And if we do, then maybe I’ll finally think about that sump pump.